Though some retailers interviewed by TDmonthly Magazine in December 2013 told us they don't sell specific Halloween merchandise, others touted the selling power of items such as fake mustaches, face painting kits, and of course costumes! Other retailers told us that while they don't carry specific Halloween items, they do creatively merchandise their stores to reflect the spirit of the spookiest season. Take a look at our retailers' Top-10 Best-Selling Halloween products below. The flexible wire inside this 6.75" black mustaches allows it to be shaped in various styles, including the friendly barber, the stern general and the dapper dandy. It comes with a rubber piece that clips to the nose. 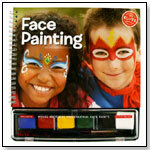 — Two of 38 specialty retailers mentioned mustaches as a best-selling novelty item in fall 2008. Michelle Bears, owner of The Toy Store in Highlands, N.C., told TDmonthly her store sells about 48 Accoutrements fake mustaches per month. — Donna Frederick, owner of The Play House Toy Store in Durham, N.C., told TDmonthly in a December 2011 survey about Halloween that, "Accoutrements sells a set of novelty mustaches that is very popular." 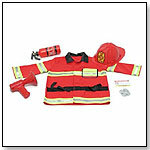 This authentic-looking fireman costume features bright stripes and comes with a hat, a megaphone, an ax, a fire extinguisher and other accessories. It retails in a clear vinyl bag. Launch date: 2008. — “Melissa and Doug have great dress-up costumes ... those are moving briskly,” said Diana Nelson, owner of Kazoo and Company in Denver, Colo., about her top-selling dress-up items in March 2010. — In a December 2013 survey two out of 10 retailers told TDmonthly that fire fighter costumes were one of their best-selling Halloween costumes. This fun kit includes 4 colors of Body Glitter (2.8 g/0.10 oz); 1 Body Glue (3 ml / 0.10 fl oz); 12 3"x2" Self Adhesive Stencils; 2 pc. brush set; Instruction/Care Card. — Barb Stine, owner of Toys on the Square in Hershey, Pa., told TDmonthly in a December 2013 survey that tattoos are one of their best-selling Halloween toys. Satin Cape with an overlay of glittery silver organza. The back is embellished with a silver crown. The front has a white bow with a velcro closure, and the cape is trimmed with a silver metallic bias. Launch date: May 2012. — In a December 2013 survey two out of 10 retailers said that Creative Education costumes were their best-selling Halloween products. This product was a 2009 ASTRA Best Toys for Kids Winner — the only costume to win this award in 2009 in the Pretend/Fantasy Play category. The green Dragon side is made with shimmering scales and a yellow dragon tail. The silver Knight side emulates a glittering armor and is embellished with a red and black emblem. The Reversible Dragon/Knight Hood (sold separately) completes the look of this fiery dragon and a feisty knight. "This is a truly unique and high-quality design and it's sold for the specialty market only," Veesha Knight, sales and marketing manager for Creative Education of Canada, Inc., told TDmonthly. Launch date: February 2009. Awards: 2010 Children's Choice Award by the Canadian Toy Testing Council. — Donna Frederick, owner of The Play House Toy Store in Durham, N.C., told TDmonthly in a December 2011 survey that "We ran out of capes this year," and that she will definitely order capes from the Great Pretenders line by Creative Education again for Halloween next year. A charming little fairy from a familiar tale, the I Won't Grow Up character costume is comprised of a stretch velvet leotard in glittery forest green with an attached petal skirt in several layers of chiffon. It is accented with sheer fabric flowers. A pink tiara is included, and it pairs with various wings or other accessories from the A Wish Come True line. — “The fairy tutus, anything like that,” said Katherine King, manager of Giggles Toys and More in Bozeman, Mont., who listed A Wish Come True as one of her top-selling lines dress-up lines. 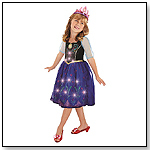 — Six percent of 52 retailers listed A Wish Come True for their top-selling dress up in early 2009. 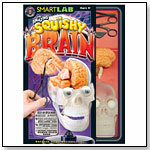 Build a brain and then pick it apart with this sequel to the Squishy Human Body. This anatomically correct model, complete with moving mandible (jawbone) and squishy plastic brain and eyes, makes for a realistic experience of our body's gray matter. With the included illustrated book, kids go on a tour through the sense, movement, memory, emotion, decision-making, and automatic functions like breathing and digestion. Phenomena like brain freeze and notes on how and when things go wrong are also explored. Includes: 9-piece transparent skill that fits together at the sutures, 8 squishy brain parts, Squishy eyeballs, 4 vertebrae pieces with spinal cord, Skull base, Tools: forceps, scalpel, and tweezers, Skull map, Brain blister with labels, and 32-page, fully illustrated book. — In a December 2013 survey two out of 10 retailers told TDmonthly that skull and brain novelty items were Halloween best-sellers. Follow the simple instructions on the back of the box and you will be rewarded with a lifelike brain gelatin dessert. The mold is 9" x 7" x 4" (22.7 cm x 17.8 cm x 10.2 cm) and made of non-toxic green plastic. It comes in an illustrated window box. — Mary Porter Green, owner of Curiosity Zone in Ashburn, Va., told TDmonthly in a December 2013 survey brain molds are one of their best-selling Halloween toys. •Disney – is Infinity leading the way?